Sony a6400 review at Admiringlight. 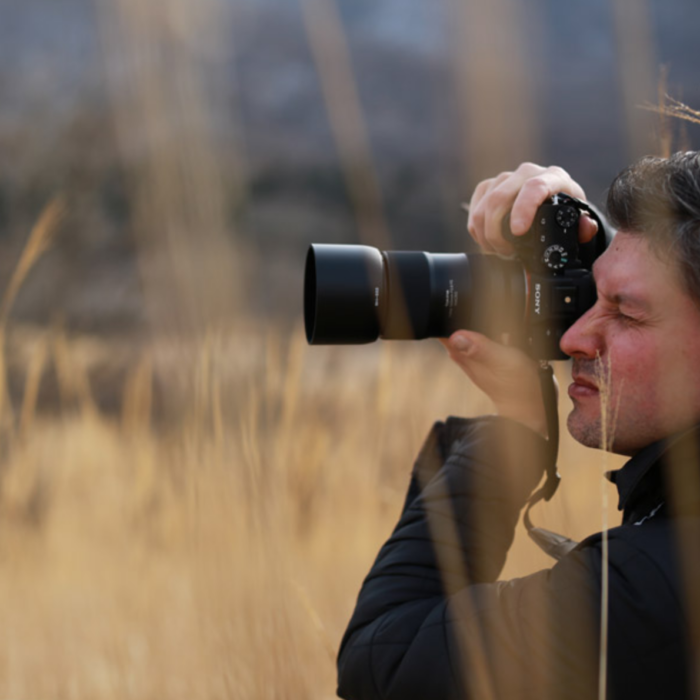 Sony 85mm f/1.4 GM – The Portrait King | In-Depth Review (David Zhou). Do you even Vlog bro? Sony A6400 and RX100VI (TheDigitalDigest). Sony a6400 & a7iii how to shoot and edit HLG in Final Cut X (David Oastler). 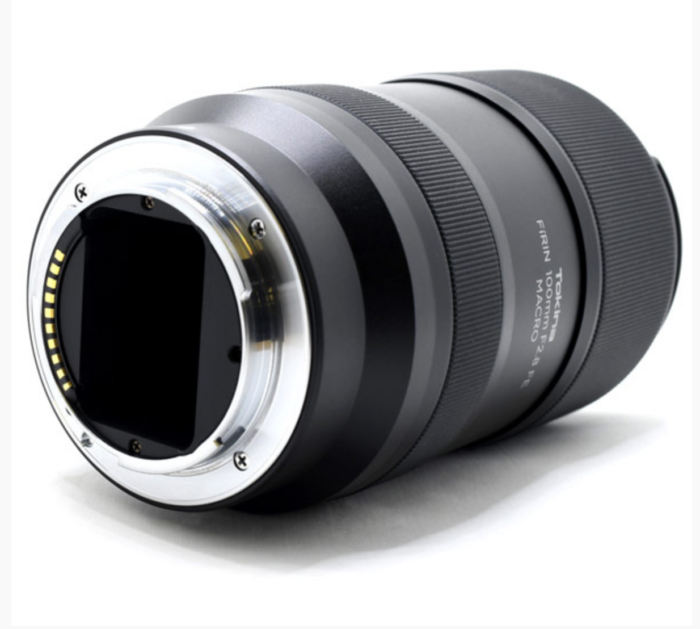 The new Voigtlander 50mm f/1.2 FE is in Stock for the first time via Amazon (Click here). $1000 off on the Sony A9 at Buydig, BHphoto, Adorama, Amazon, BestBuy. FocusCamera. $400 off on the SonyA7rIII at BuyDig, BHphoto, Amazon, Adorama, FocusCamera. $400 off on the Sony A7rII at Buydig, BHphoto, Amazon, Adorama and Focuscamera. $400 off ($600 off with kit lens) on the Sony A7II at Buydig, BHphoto, Amazon, Adorama and Focuscamera. $150 off on the Sony 6300 at Buydig, Amazon, BHphoto, Adorama and Focuscamera. $200 off on the Sony 6000 at Buydig, Amazon, BHphoto, Adorama and Focuscamera. $150 off on the Sony 5100 at Buydig, Amazon, BHphoto, Adorama and Focuscamera. 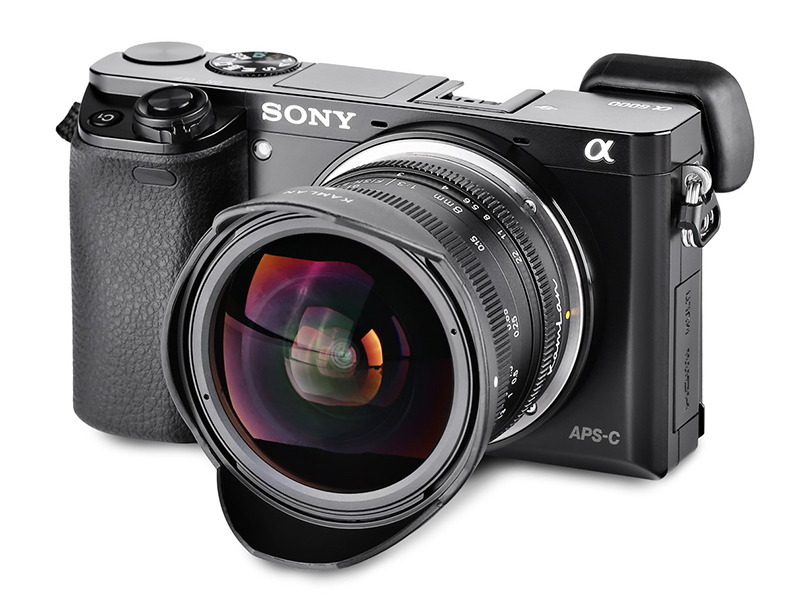 $200 off on the A6000 dual kit at Buydig, Amazon, BHphoto, Adorama and Focuscamera. $100 off on the 12-24mm f/4.0 lens at Bhphoto, Adorama, BestBuy, Focus and Amazon. $100 off on the 16-35mm f/4.0 Zeiss lens at Amazon, Adorama, BHphoto. $100 off on the 24-70mm f/4.0 Zeiss lens at Amazon, Adorama, BHphoto. $200 off on the Sony 24-105mm FE at BHphoto, Amazon, Adorama, FocusCamera, BuyDig. $100 off on the 24-240mm lens at Amazon, Adorama and BHphoto. $25 off on the Sony 28mm FE lens at Amazon, Adorama, BHphoto. $50 off on the Sony 28-70mm FE lens at Amazon, Adorama, BHphoto. $100 off on the Zeiss 35mm f/1.4 lens at Amazon, Adorama, BHphoto. $100 off on the Zeiss 35mm f/2.8 lens at Amazon, Adorama and BHphoto. $100 off on the Zeiss 5omm f/1.4 lens at Amazon, Adorama, BHphoto. $50 off on the Sony 50mm FE f/1.8 lens at Adorama, BHphoto, Amazon, Focuscamera. 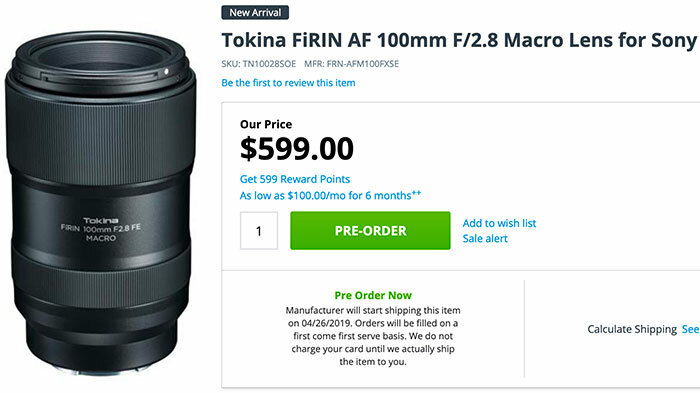 $50 off on the Sony 50mm macro at BHphoto, Adorama and Amazon. $100 off on the Zeiss 55mm f/1.8 lens at Amazon, Adorama and BHphoto. $50 off on the Sony 85mm f/1.8 FE at Buydig, BHphoto, Amazon, Adorama and Focuscamera. $100 off on the 70-200mm G lens at Amazon, Adorama and BHphoto. 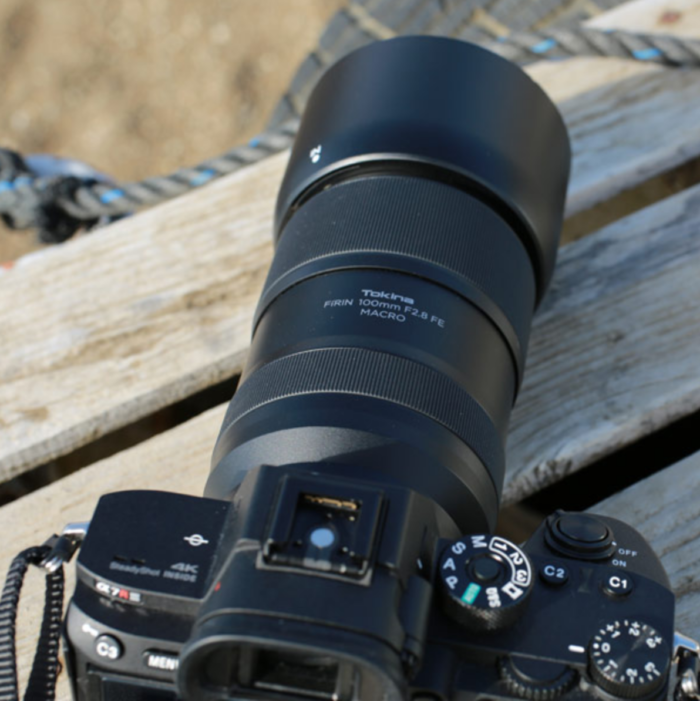 $100 off on the 70-300mm lens at Amazon, Adorama and BHphoto. 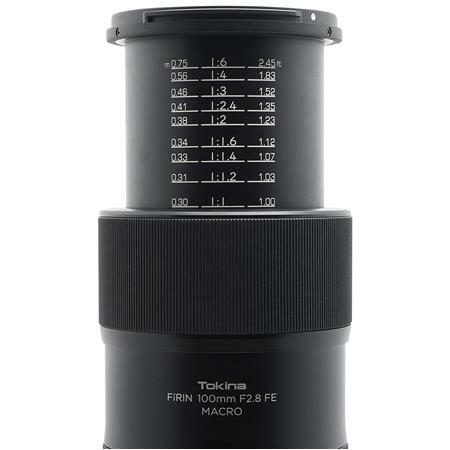 $100 off on the 90mm macro lens at Amazon, Adorama, BHphoto. $50 off on the Sony Fisheye Conversion Lens for FE 28mm F/2 at Amazon, Adorama, BHphoto. $50 off on the Sony Ultra-Wide Conversion Lens for FE 28mm F/2 at Amazon, Adorama, BHphoto. $100 off on the 10-18mm lens at Amazon, Adorama and BHphoto. $50 off on the 16-50mm lens at Amazon, Adorama and BHphoto. $100 off on the 16-70mm Zeiss lens at Amazon, BHphoto, Adorama. $50 off on the 18-105mm lens at Amazon, Adorama and BHphoto. $100 off on the 18-135mm lens at BHphoto, Adorama, Amazon, FocusCamera and BestBuy. $100 off on the 18-200mm lens at Amazon, Adorama and BHphoto. $100 off on the 18-200mm PZ lens at Amazon, Adorama and BHphoto. $50 off on the 20mm f/2.8 lens at Amazon, Adorama and BHphoto. $100 off on the Zeiss 24mm f/1.8 lens at Amazon, Adorama and BHphoto. $25 off on the Sony 30mm macro at Amazon, Adorama and BHphoto. $50 off on the 35mm f/1.8 lens at Amazon, Adorama and BHphoto. $50 off on the 50mm f/1.8 lens at Amazon, Adorama and BHphoto. $50 off on the LA-EA3 A-mount adapter at Amazon, Adorama, Bhphoto. 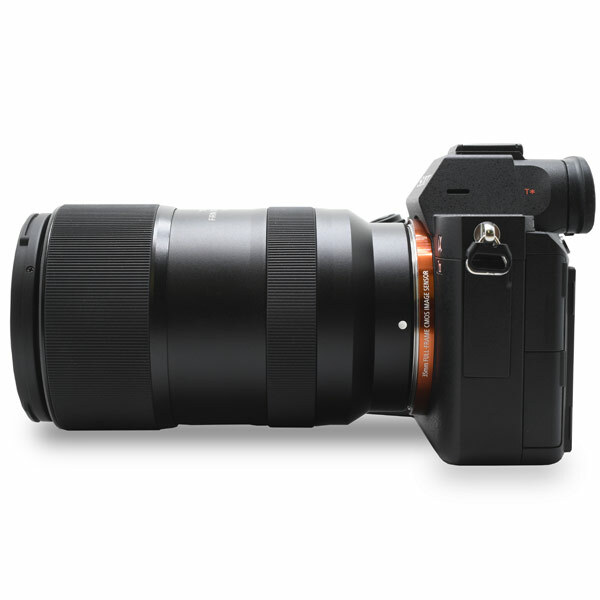 $50 off on the LA-EA4 A-mount adapter at Amazon, Adorama, Bhphoto. $50 off on the HVL-F43M at Amazon, Adorama, Bhphoto. $100 off on the HVL-F60M at Amazon, Adorama, Bhphoto. $50 off on the Sony VGC1EM Vertical Grip at Amazon, Adorama, Bhphoto. $50 off on the Sony VGC2EM Vertical Grip at Amazon, Adorama, Bhphoto. $50 off on the Sony VGC3EM Vertical Grip at Amazon, Adorama, Bhphoto. $50 off on the Sony ECM-CG60 at Amazon, Adorama, Bhphoto. $50 off on the Sony RX100 underwater housing at Amazon, Adorama, Bhphoto. 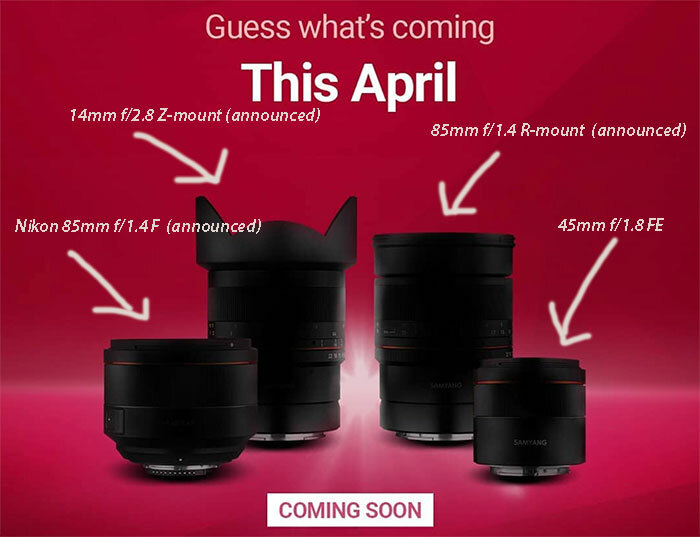 Kamlan announced that their new 8mm f/3.0 APS-C E-mount lens will be released tomorrow. It will be available soon on that Amazon page. 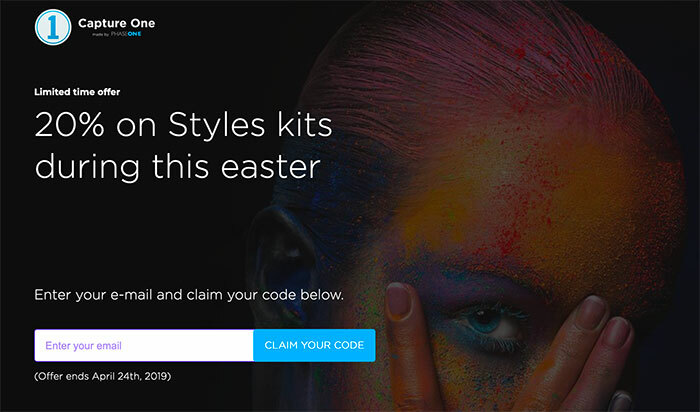 If you click on this link you save 20% on Styles kits during this easter! 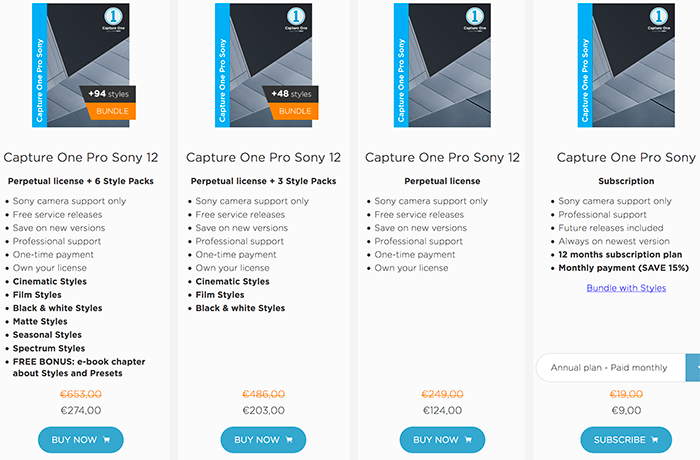 And don’t forget that you get 50% off on all Capture One Sony perpetual license, subscription and style bundles if you buy them before April 30! 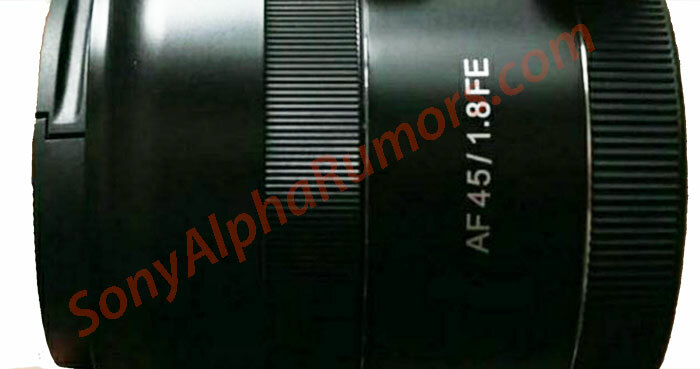 This is the first leaked image of the soon to be announced new Samyang 45mm f/1.8 FE autofocus lens! 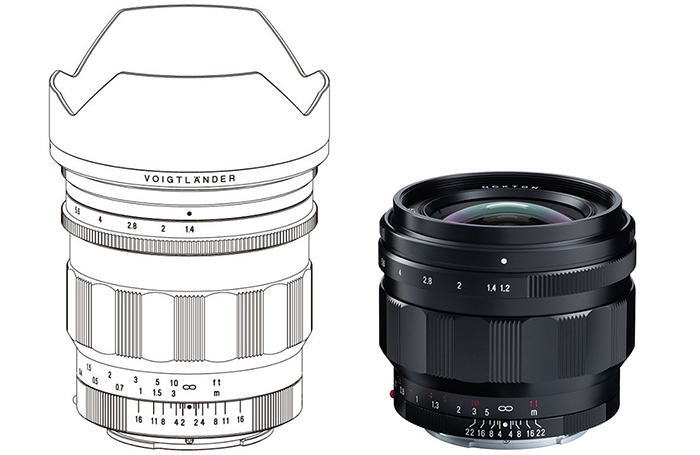 Voigtlander announced this new 50mm f/1.2 FE lens. 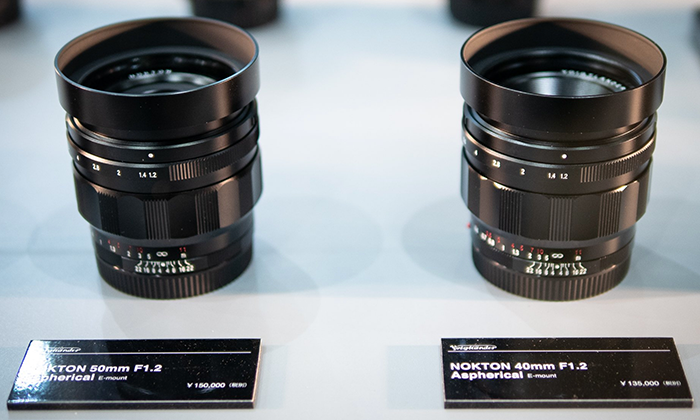 I do own the current 40mm FE and I am very tempted to buy this new 50mm lens too.